One of my favorite things ever is when we sit around the table at Thanks­giv­ing and take turns telling what we are par­tic­u­lar­ly thank­ful for, that year. I get a lit­tle choked up, espe­cial­ly when I lis­ten to my sons. Were you a teacher’s pet or teacher’s chal­lenge? Upon reflec­tion, I think I was prob­a­bly a fair­ly chal­leng­ing teacher’s pet, as well. What’s the first book report you ever wrote? I can’t be absolute­ly cer­tain, but I think it was The Witch Fam­i­ly by Eleanor Estes. Besides the fab­u­lous mix of real­i­ty and fan­ta­sy, which I have always loved, the great thing about that book was that I dis­cov­ered it when it was my turn to choose library books for our small in-class­room library. All the oth­er third grade girls loved my choice, and begged to read it after me; and for a week, I was pop­u­lar! Do you like to gift wrap presents? Yes, and I thought I was pret­ty good at it until we had an all-fam­i­ly Olympics one sum­mer. One of the events was gift-wrapping—blindfolded—and my team put me head-to-head with my old­er sis­ter, Kathy. Not to put too fine a point on it, she mopped the floor with me. What do you wish you could tell your 10-year-old self? What 3 children’s book authors or illus­tra­tors or edi­tors would you like to invite to din­ner? Louisa May Alcott: She cap­ti­vat­ed me on a fam­i­ly vaca­tion with Lit­tle Women. I had already read through the stack of books I’d brought for the car trip, and my moth­er bought that book for me instead of the com­ic book I want­ed. Though I com­plained at first, I read the first page—and I was hooked for­ev­er. C.S. Lewis: He pulled me into his mag­i­cal world of Nar­nia, with its great themes of good and evil and chil­dren whose choic­es had pow­er­ful reper­cus­sions, and I only wished he had writ­ten a hun­dred sto­ries for me to devour, instead of just sev­en. Madeleine L’Engle: I still remem­ber exact­ly where I was when I read A Wrin­kle in Time in sixth grade, and how I reread the final chap­ter because I couldn’t bear for it to be over. When I closed the book at last, I knew that what I want­ed to do most of all was to write sto­ries like that, for kids like me. It depends on the sea­son! Lynne Jonell is a writ­ing teacher and the author of five nov­els, four chap­ter books, and sev­en pic­ture books for chil­dren. Her books are fre­quent­ly select­ed for the Junior Library Guild, have received starred reviews in Horn Book, Kirkus Reviews, School Library Jour­nal, Pub­lish­ers Week­ly, Book­list, and Sesame Street Par­ents, and have been pub­lished in nine lan­guages. 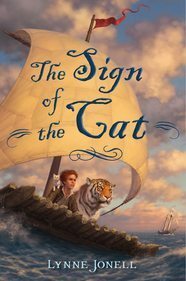 Her newest nov­el, an adventure/fantasy for ages 8–14, is The Sign of the Cat. She lives in Min­neso­ta. For more infor­ma­tion please vis­it her web­site. Please invite me to your lit­er­ary din­ner, Lynne. I’d love to hear those three authors talk. I’ll even do the dish­es after!